flooding, and this is even true in regions that are prone to extreme rainfall. 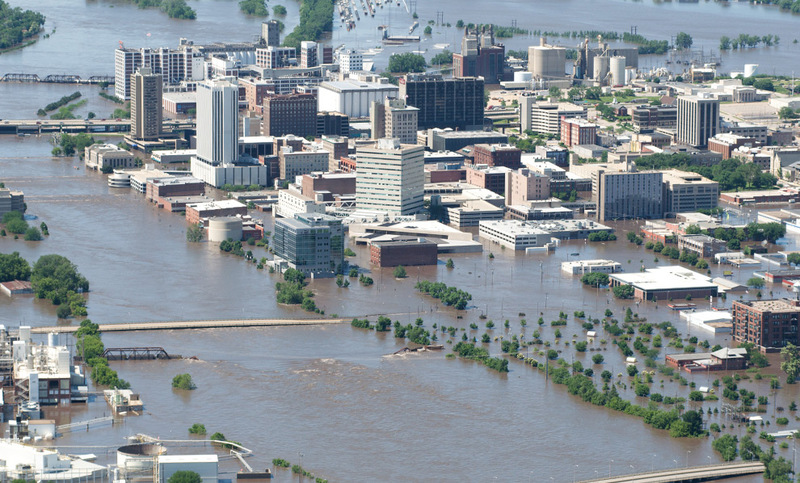 When we analyze the local economic impact of large floods, we find that on average they reduce urban economic activity by between 2 and 8 percent in the year of the flood… These effects are even stronger (up to a 12 percent reduction) for low elevation areas. [R]ecovery, even in the harder hit low elevation areas, is relatively quick, with economic activity fully restored within a year of the flood. So they basically suggest that floods tend to have very short-term impacts and flood-prone areas correlate with higher income. … governments typically foot much of the bill for building and maintaining flood defences. When cities are devastated by large floods, low-lying areas sustain more damage than other areas. But, like other parts of flooded cities, the low elevation areas recover rapidly… But unfortunately, it means that economic activity does not move to safer areas, so it remains at risk from the next big flood. rich region: amenities (like living close to the sea). The New Economic Geography argument, that there are increasing return to agglomeration, should not hold simply because one could build a new city in areas that are less flood-prone. Hence, one of the three arguments above seems most reasonable. Another point could be that most flood-prone regions are at rivers or at the sea, which implies better options for trading, for access to (free) food through fishing. This is the same point as the one raised by higher agricultural productivity. This suggestion is very one-sided, indeed, and implies that those that live in flood-prone areas are `guilty’ of doing so. But it could very well be that the economic benefit from producing in that area outweighs the social costs of a flood. In this case the government should actually subsidize (in case there are positive externalities from living there) those regions. Or it should provide sufficient disaster aid to allow people to quickly move back into those areas. And it certainly implies that the government should potentially pay for flood defences (depending on the costs) to make those regions safer. If individuals move to flood-prone areas simply because it provides an amenity value to them that exceeds their personal costs in case a flood occurs, then the government needs to evaluate whether this amenity value minus the personal cost exceeds potential social costs, e.g. to infrastructure. If it does, then there is an overall social benefit from living in flood-prone areas. The question then still arises as to whether a government should provide disaster aid of any kind in case a flood occurs. Or whether these individuals then would need to pay for this disaster aid themselves. Overall, the problem of what to do with population in disaster-prone areas is not as simple as some authors make it out to be, and it certainly depends on the reasons for which people live in those areas as much as it depends on the social impact that these people have from living in those regions and the potential costs of disasters.